This year, I bought a new Browning BLR in .450 Marlin with a Monte Carlo stock and no iron sights. I topped it with a Trijicon AccuPower 1-4x24 scope on Talley BLR rings. The total weight of rifle, scope, and rings is 8.25 lbs. Since this rifle has no sling mounts, I ordered a Blackpowder Products “The Claw” Shotgun Sling. Before fielding this gun for hunting season, I sent it to Robar for a refinish in black Poly T-2, and then to Neil Jones for trigger and action work. I am very happy with both jobs. The black Poly T-2 finish looks good and feels durable, and I am no longer paranoid about maintaining the blued steel finish or worrying about corrosion. I have no idea what the BLR’s trigger felt like before Neil’s trigger job, but I had read many stories about gritty, heavy BLR triggers. In fact, it seems the trigger is the only thing BLR owners generally complain about, so I didn’t want to take the chance. I have custom trigger jobs on my 1911’s and am a bit of a trigger snob, so a good trigger is important to me. I have to say this BLR trigger by Neil Jones is crisp, smooth, and breaks cleanly. I didn’t get a chance to measure the pull weight, but it is reportedly around 3 lbs. Although the Browning BLR is a unique looking gun that others have said is “ugly” or “weird,” I personally find it very attractive. 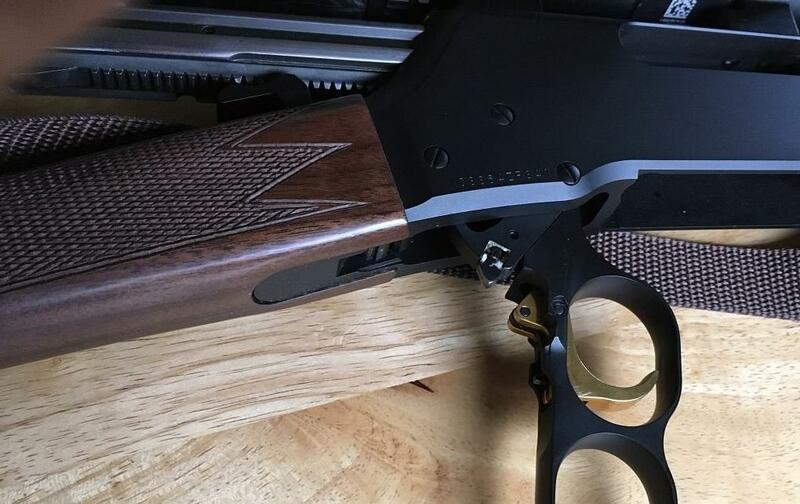 The design isn’t “classic” lever action, but the profile of the stock is thin, the wood looks good, and the short barrel design make it very handy. 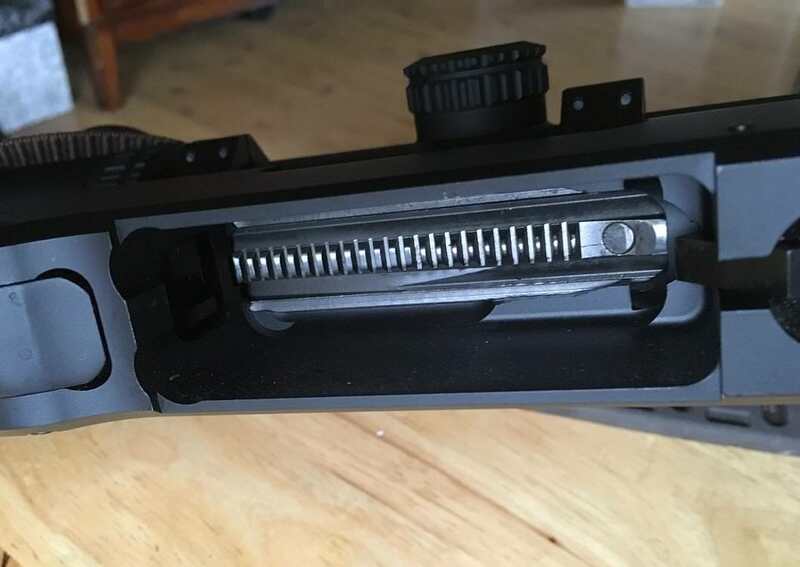 The Trijicon AccuPower 1-4 scope is just the right size for this rifle, in my opinion, and I like how the black Poly T-2 finish matches the Trijicon scope and the Talley mounts. 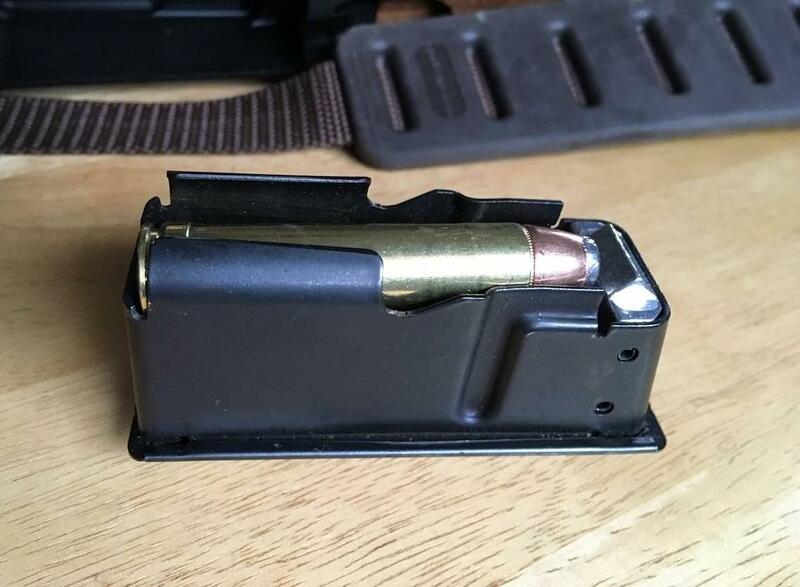 Entering this load in QuickLoad says it is at 83% case fill and should leave the muzzle of my 20” barrel .450 Marlin @1878 fps, @2350 ft.lbs. of energy, @24857 psi, and @88.4% of powder burnt. I ran this load through Hornady’s online ballistic calculator, which showed a drop of -1.7”@125 yards, -4.5”@150 yards, -8.4”@175 yards, and a whopping -13.5”@200 yards. So I plan to keep my shots within 150 yards with this setup, needless to say, absent a lot of practice. The stands I sat in this rifle season didn’t present shots that far, anyway. 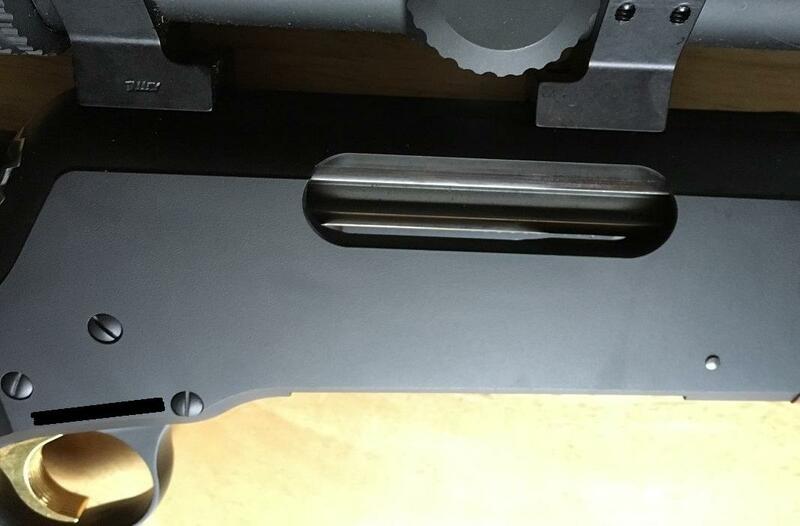 Shouldering the gun quickly, with its Monte Carlo stock and the Talley BLR rings, brings the scope right to my eye with a good cheek weld on the stock. In various lighting situations, the BDC reticle and crosshairs were easy to spot, and the green dot and segmented circle are nice in low and ambient light. Like all illuminated reticles, it washed out almost completely in bright light, but the etched reticle still remains black and razor sharp. I topped the scope with Butler Creek flip-open covers.Now for the actual hunting performance of this rig: at 8.25 lbs. with a 20 inch barrel and a good sling, it’s comfortable taking on extended walks through the woods. 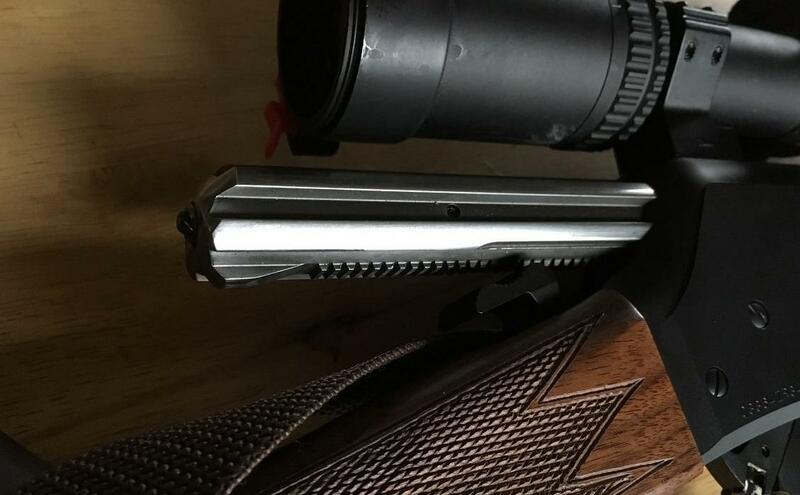 While sitting in the stand or against a tree during the preceding four or five days before I actually shot a deer, I had been practicing quietly and quickly shouldering the rifle and finding the reticle. When it counted, I was able to do so. It was late in the morning when I shot my deer, so I had the reticle illumination dialed to 11, and the illumination was visible. I had tested it against a target in bright, full sunlight before and knew the reticle would not be illuminated under bright daylight circumstances, but pointing the scope at brush, the reticle was illuminated. The BLR is a very handy rifle, and the Trijicon 1-4 balances it very well. 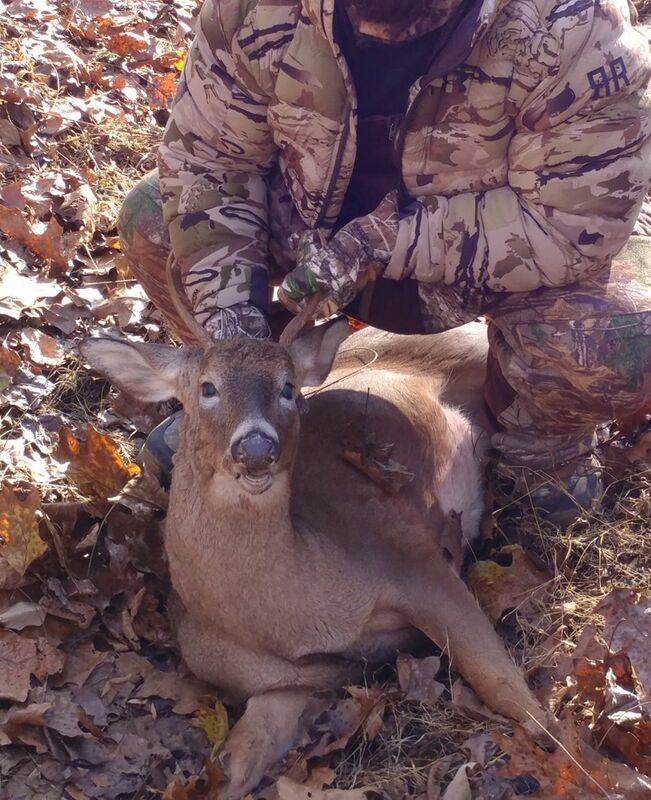 I shot my first buck of the season on Thanksgiving morning. 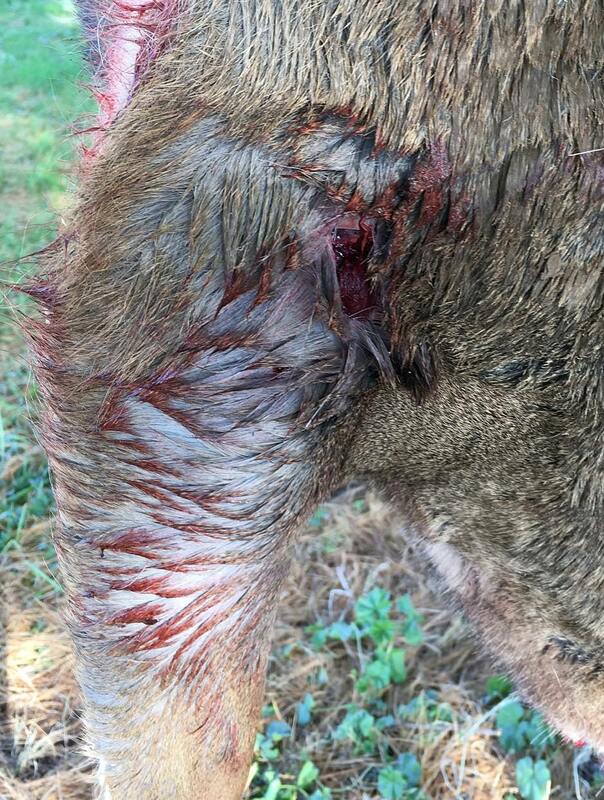 The shot was just behind the shoulder, directly through the heart, at about 75 yards. 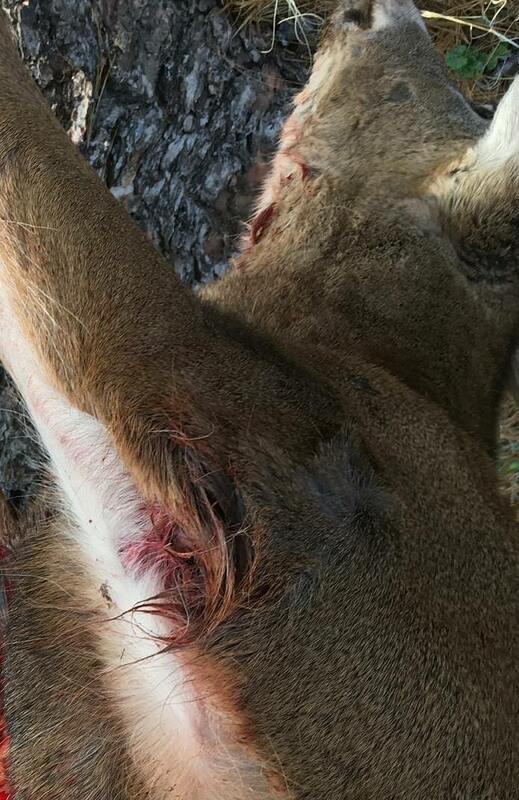 The buck was a medium body four point. Nothing to brag about, but still a buck in a hunting camp that has been pretty low on deer lately. The exit wound seemed to indicate a good expansion without causing excessive damage like a high-powered rifle round might do, and the heart was completely obliterated. The buck ran a short distance before expiring and falling down the hill. 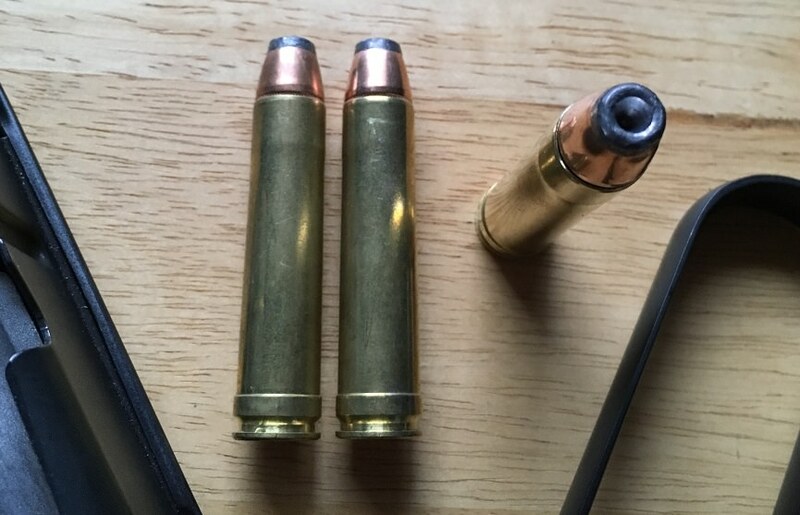 I was very pleased, as the ammo did exactly what I wanted: mild recoil, full pass-through penetration, and expansion at .450 Marlin distances on deer-sized game. So there is my report. I am very happy with this set up and will continue hunting with it in this terrain. If I ever hunt at longer distances or in open fields which might present 200 yard or longer shots, I’ll look at a different rifle for that kind of hunting.My future plans for this rifle are to work up my own hard cast load using 420+ grain WFN gas-checked bullets at 1500 to 1650 fps.